SET DOES NOT INCLUDE THE CLI681XXL Photo Blue ! Yes they have the micro chip attached simply insert cartridges and print. 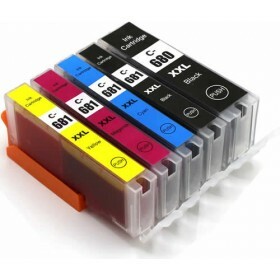 Yes your printer will recognize these cartridges and they will show the correct ink levels. The website is tasteful and well set out, isn’t clogged with ads, is straight forward and easy to follow. I appreciate all the advice and information on the site and I found Ink Hub personnel, very friendly and helpful on the ‘phone too. The reorder link is most helpful. My last delivery was very prompt and I had no problems with the product. Fast delivery and cartridges work well, very competitive prices. Half the price of the Canon cartridges and no difference in print quality. They installed without an issue and so far are working fine. Easy to use website and great to have the PayPal payment option. This is the second time I have ordered my Canon inks from these guys and really happy with the quality and speedy postage. Will definitely order from them again.